Disease: Trees may develop diseases that can infect other trees or plants in the vicinity. Age: Trees have a natural life expectancy and when they die, they may pose serious threats to safety and nearby structures. Aesthetics: Trees may dominate the landscape and/or sunlight, making it hard for other plants to grow or they may not look very attractive on a property. Renovation: Trees may get in the way of plans to alter the existing design of a structure. Safety: Structural damage to trees and their limbs can render them unsafe. Damage: A tree’s root system can damage foundations or underground pipes, which may cause costly repairs. While regular and routine maintenance could have prevented many of these situations, there are times when complete tree removal may be the only option. The do-it-yourself spirit is strong among many Milwaukie residents, which is great for projects around the home. It can save money while also giving homeowners a sense of independence. However, a tree removal operation is complex and can be very dangerous. Getting the expert help you need will ensure trees are removed quickly and safely while avoiding costly mistakes or injuries. ArborPro Tree Experts have the proper equipment and a skilled crew that offer complete tree service you can rely upon for all of your tree care needs. From trimming to complete removal, we use state of the art methods and technology. Regardless of the size of the job or tree, we are capable of providing the best service while staying within your budget and schedule. Our expert tree trimming service will keep your trees looking great, as well as remove any safety risks from unwanted or unhealthy branches. 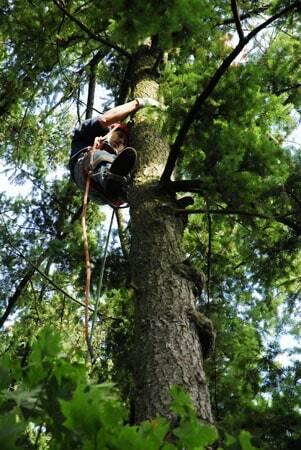 Give us a call today and get the best professional tree service in the Milwaukie area.